There’s no doubt that Rajnikanth has the biggest fan following in India. The superstar Rajni is often dubbed as the biggest star in India and it is a celebration time for his fans whenever his movies come out. His latest movie “Kaala Karikaalan” is a long-awaited movie that hit the theatres this week. To mark the new release, one of his numerous fans has put large decals of the movie on his Jeep Compass. 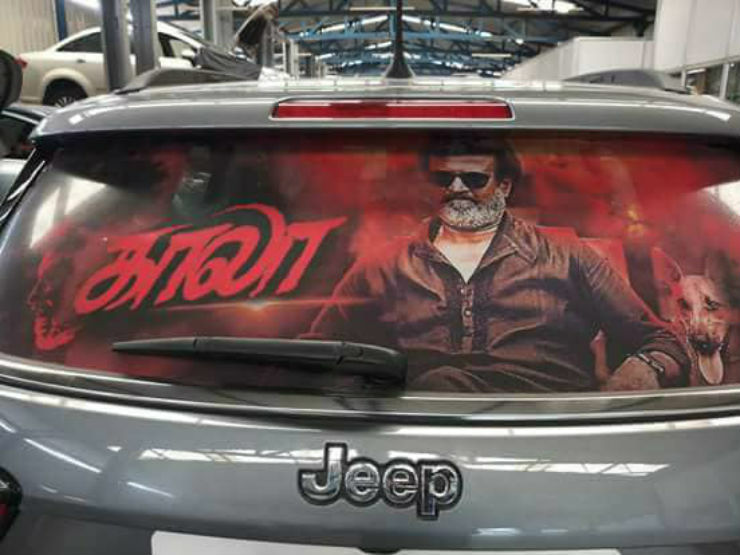 Details like who has done it or from where the picture has surfaced are not known but such decals and body wraps become quite common whenever a Rajnikanth movie is released. The same practice was seen during the release of “Kabali” two years back. People wrapped all kinds of cars from Maruti Swift to GT-R to celebrate the movie’s release. Air Asia even wrapped an entire aeroplane with the movie’s poster. 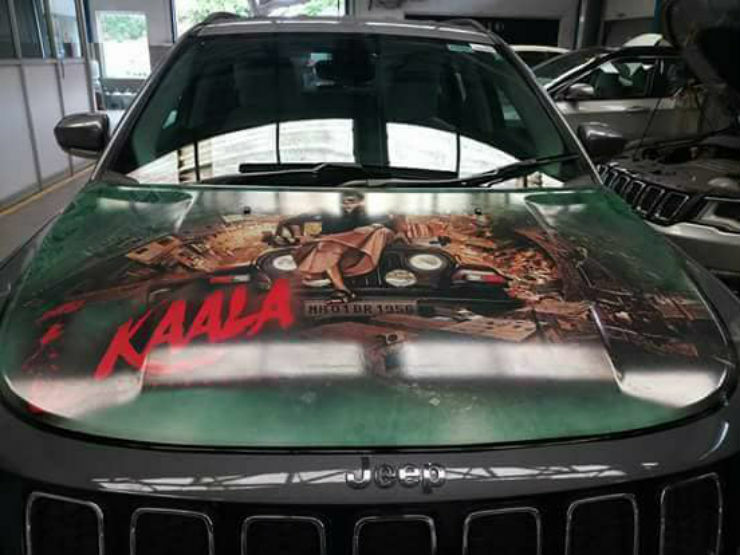 The Jeep Compass with the movie decals gets the popular movie poster where Rajnikanth can be seen sitting on the bonnet of the Mahindra Thar. This poster is placed on the bonnet lid of the Jeep Compass. The rear windshield gets another poster from the same movie. Incidentally, the Thar used in the movie was recently grabbed by Anand Mahindra for his museum. Such customised decals can be done by any popular wrap house in India. These decals are printed and then pasted on the car’s body. The rear windshield poster is perforated and acts like a sunshade. Such decals and wraps are not illegal and can be used on any car. People often use such body wraps to change the colour of the vehicle. It is an effective solution than painting the whole car that requires changes in the registration certificate too. While fan following is extremely strong in Tamil Nadu, there are many fans all over the country who do such unexpected things to show support to the superstar. We are sure that in the coming days, many more such regular and high-end cars will be wrapped with the posters of the new movie. Keep checking this space for more!